« 3-Page Previews: ARCHER & ARMSTRONG #11 is [REDACTED]! “These masks used to mean something. Now they are just used to hide who you really are.” This statement (uttered to Killjoy’s young protagonist by new arrival, Cheri Cola), seems to sum up what this series is really about. An examination of identity masked in a post-apocalyptic, mystery/adventure. 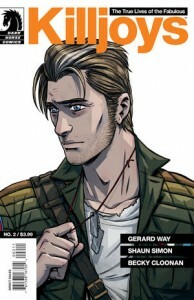 Gerard Way and Shaun Simon have definitely created something very cool here. Though its twisting plot, that jumps around in time and place, is a bit convoluted at times, it is this same jagged plotting that galvanizes your attention, and keeps you craving for more. You are continually find yourself asking, “What the hell?” Which in the case of this series, is a thoroughly enjoyable state to be in. As always, Becky Cloonan continues to find a perfect illustrative balance between the mar of apocalyptic detritus, and the baroque of utopian splendor. She also adds a wonderful glam/punk aesthetic to the characters, which I’m sure is entirely intentional, and (at least in this reader’s opinion) much appreciated. This series is wrapped in so much mystery, that even the protagonist—known only as: The Young Girl—is just as much an enigma as are the Killjoys themselves. With the introduction of every new character there is this sense of a new piece being added to a puzzle, but this puzzle doesn’t seem to have an end, it appears to be continually growing, and expanding. Ultimately, what it finally reveals will be what either makes or breaks the series. Fortunately for the reader, we’ve been invited along for the ride! This entry was posted in Columns and tagged Becky Cloonan, DARK HORSE COMICS, gerard way, Jared W Lindenberg, shaun simon, the true lives of the fabulous killjoys. Bookmark the permalink. Follow any comments here with the RSS feed for this post. Post a comment or leave a trackback: Trackback URL.